Do you want a free Vibram T-Shirt? Well, Vibram will give you one if you buy three Vibram Discs between now and Christmas. Vibram makes some of the best and most durable golf discs on the market. The enhanced grip that only rubber can provide is especially valuable for winter disc golf. Vibram has two new distance drivers that have been huge hits. The unLace is perhaps the best beginner driver ever made. The oLace is outstanding for advanced big arm players who throw with power. How do I get a free shirt? To take advantage of this free giveaway, simply buy any three Vibram discs, save your receipt, and fill out this simple form. We received replies from several bias individuals bragging up their own state, or in less common cases, putting their vote to another state. Either way, the visual representation below does accurately reflect some of the best places for disc golf. The more responses for the state, the more vibrant the shade of green. Question: If I am not in Michigan, California or Texas, then what am I doing? 1) I should be packing my bags and moving, because I live to disc golf. 2) I’m working to make disc golf better right in my backyard! How can you improve the sport in your area? There are many ways to make your area better! The first step is to become involved in organized disc golf. Most areas have a club with at least a few members, and those clubs organize and lobby efforts to improve the game locally. They organize fund-raising for courses, talk to city representatives, and bring better overall awareness to the sport. One of the best ways to find a club is to look on Disc Golf Scene, or on Facebook. We want to know, what are you doing to help grow the sport?? Tell us below! In order to secure yours, PRE-ORDER by November 1st. That is when we will place our order. These will be officially available on November 8th, and will be sent out at that time. “We are excited to add a little twist to our style. We have now available for a limited time some of our popular models with a unique side offset stamp of the new MVP Orbit logo. This minimalistic stamp harmonizes the beauty and style of our discs. This stamp will be available in the following popular models: Neutron Ion, Neutron Tangent, Neutron Volt, and Eclipse Soft Anode. The first time you buy golf discs, you may be tempted to pick your favorite color. After playing a few rounds on courses with thick vegetation, your disc color preferences just might change. When it comes to playing satisfaction, brightly colored discs are best. Nearly 68% of the responders specifically included terms like “bright, day glow, neon, or hot” in their color description. Orange was the next most common color selected. 13% of respondents prefer bright orange discs that stick out in any disc golf terrain. Blue, Green, and Yellow round up the remaining popular colors; each with 12% of the total votes. Once again, it was the “bright” variations of these colors that were specified. Aqua, teel, baby, and metallic blue were specified among the different blue variations. From those that selected yellow, 75% specified either bright, day glow, or chartreuse. Similar responses resulted from those who selected green. Other colors selected that weren’t as popular include red, purple, white, black, and tye dyed. While there are some disc golfers that prefer these color for their discs, they are in the minority. In the end, when it comes to disc golf discs, bright colors win out. If you’ve been away from disc golf for a few months, there are several new discs that have recently hit the market. Some of these new discs are completely unique and unlike any golf disc you’ve ever thrown. In case you’re looking for some new plastic to experiment with, here’s a break down of the new additions we’ve received in the last month and a half. Discraft Crank: The all new Crank by Discraft is nothing revolutionary, it’s simply an ultra fast driver that flies straight. The ESP plastic has been around for a while. Despite the fact that there is nothing extra-ordinarily special about it, the Crank is already our top selling disc of 2013 — and we’ve had it for sale for less than two months! In terms of total sales for the year, only the Prodigy D1, D4, and Vibram Lace come close to the Crank. Discraft’s reputation and positive user experience have made the Crank a very popular new disc. Innova Atlas: The Atlas really is a revolutionary disc. While there are other manufacturers that make two plastic over-mold discs, the feel and flight of the Atlas is unique. This straight flying midrange has an ultra grippy rim and a firm, flat flight plate. The Atlas’s flight path is very smooth with a most moderate fade. The grippy rim helps this disc stick to the ground and reduce skipping. The double plastic mold make the Atlas one of the more expensive discs for sale, but those who have tried it have been nothing but impressed by the results. Vibram unLace: The new Vibram unLace is perhaps the most understable high speed distance driver ever made. This thing is super easy to throw, and will likely become one of the top drivers for newer disc golfers looking for more distance. This disc is available in the soft x-link medium as well as the x-link firm blend giving it a great look and feel. If you’re looking for a driver that will experience high speed turn with moderate throws, the unLace will deliver unparalleled results. Hyzer Bomb Discs: Partnering with Millennium, Hyzer Bomb, has recently released three discs: the Mortar, Tank, and Tank Panzer. The Tank and Tank-Panzer are unique feeling putters with a thumbtrak grip available in Millennium’s soft standard plastic. While the Tank is new to Hyzer Bomb, it’s actually an old golf disc that has been brought back from the dead. The Tank-Panzer feels like the Tank, but offers a more stable alternative. The Mortar is a very overstable midrange available in a unique softer plastic blend. RIP Discs: RIP is not a new company, but they are new to Infinite Discs. After receiving the Innova Atlas, and then hearing that other companies have already manufactured double mold discs, we added them to our lineup. RIP currently manufactures two putters and a distance driver. The Graboide and Relic putters are completely unique. They are tall bulky discs with an incredibly hard flight plate and a soft rubbery rim. These putters are unlike anything I have ever thrown. RIP’s driver, the Ballistic, consists of only one plastic, but it is one of the grippiest plastic blends I’ve ever felt. In addition to new disc models, we’ve also added Innova X-Outs to our product mix. This is the perfect solution if you like both Innova and cheap discs. Yikun is a disc manufacturer based in China who has recently created a new line of golf discs. Yikun currently has six different molds and three different plastic types. Each disc is available in only one plastic at this time. We are among the first to bring Yikun discs to the American market. Yikun is tooled to sit among the elite golf discs, as well as the most affordable. Yikun plastics offer extremely premium discs as well as discs which aren’t made to be thrown fast. While skepticism has been heard from consumers that a Chinese product can’t be quality, time will determine if Yikun discs deserve a seat among other top manufacturers. Here at Infinite Discs we have been pleased with what we have tried. The premium plastics impress us by the overall quality in both look and feel. Our initial field testing also did not disappoint. It is apparent that at Yikun the creation of these discs are methodical and precise. So far, our expectations have been exceeded. What is the #1 rated maximum distance driver in disc golf? While everyone has different throwing styles and opinions, according to reviewers on our website, the top rated Max Distance driver is the Latitude 64 Bolt. How do I beat in Innova star plastic? … Play lots of disc golf. Throw your disc against trees, rocks, and buildings that don’t have windows. What is the best Millennium disc for beginners? The easiest Millennium disc for beginners to throw is probably the Omega. It’s a putt and approach disc which won’t get as much distance as a driver once arm speed is developed. When it comes to best Millennium driver for beginners, I’d recommend the Polaris. Which discs are the fastest, thinnest, sharpest, disc golf drivers? There’s no doubt about it. The Gateway Ninja is the sharpest (possibly fastest as well) disc golf on the market. There’s a reason this thing isn’t PDGA approved. When it comes to thinnest, the Discraft Flick, Discmania CD and Gateway Diablo are only 1.3cm tall. What is the most expensive golf disc? Some golf discs become collectors items and are very valuable. These can sell for hundreds of dollars. When it comes to actual “retail” value of discs, Vibram discs are the most expensive discs we sell. They are all the same price ($15.88 from us). The X-link compound these discs are made of is more durable than any plastic out there. If you want your disc to last, choose Vibram. What is the best Prodigy disc for beginners. There is really only one prodigy driver I’d recommend for beginners, and that’s the F7. If there were a Prodigy starter set, it should be the F7, M4, and PA4 in 300 series plastic. 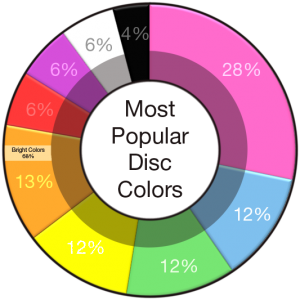 What are the best selling disc golf discs for 2013? What is the best midrange golf disc? We asked this question to our customers. While there are lots of great mids available, the Discraft Buzzz is by far the most popular.